The TIPNIS (Indian Territory and Isiboro Secure) is a Natural Reserve, Worlds Heritage, that is going to be cut in half by a road that the government of Evo Morales has decided to build for his political supporters (he is the leader for the union of coca growers) to expand the land for ilegal coca production that serves as raw material for making cocaine.The Evo Morales Government, not only did not listen to these Indians, who peacefully marched over 600 kilometers, from the Amazon to the Andes, to ask for respect for their natural habitat and the National Park but they were violently repressed, as stated in images of almost all media in Bolivia. 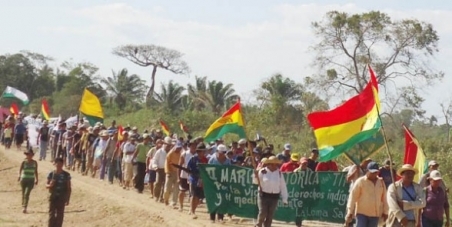 The Nobel Peace Prize for TIPNIS marchers would be a prize for the peaceful struggle of these people who just want to keep their natural lifestyle preserving a nature reserve and at the same time, a peaceful struggle against the ilegal coca production that only feeds the drug trafficking. Also, the Nobel Prize for TIPNIS marchers, would mean support for this form of "Gandhian" struggle as opposed to violent methods as happening around the world.